The Darwin Martin House was once awash in a riot of nature. The English border garden near the house provided thousands of crocuses, forsythias, irises and daffodils. Walking away from the house, visitors would see hundreds of perennials that gardeners would change every few years. There were large, billowy shrubs and European spindle trees that turned a fiery red in fall and winter. Dispersed around the property were American elm and ginkgo trees. Frank Lloyd Wright directed gardeners where to plant the artfully clustered flowers and shrubs in a sequence he planned. He was the architect of the grounds as well as the house. The flowers, shrubs and trees have been absent from the Buffalo landmark for more than a half-century – but that’s about to change. Martin House Restoration Corp. on Thursday is announcing a $1 million plan to return the complex at 125 Jewett Parkway to its historic origins, with planting expected to start in early 2016. “The scale – going from zero to 100 – will probably end up making this one of the most comprehensive and largest Wright residential garden restorations,” said Zakery D. Steele, project manager for Bayer Landscape Architecture of Honeoye Falls, which conducted a cultural landmark report required of National Historic Landmarks when public money is involved. “This is the missing piece you’re looking at when you look out from the Martin House,” Steele said. 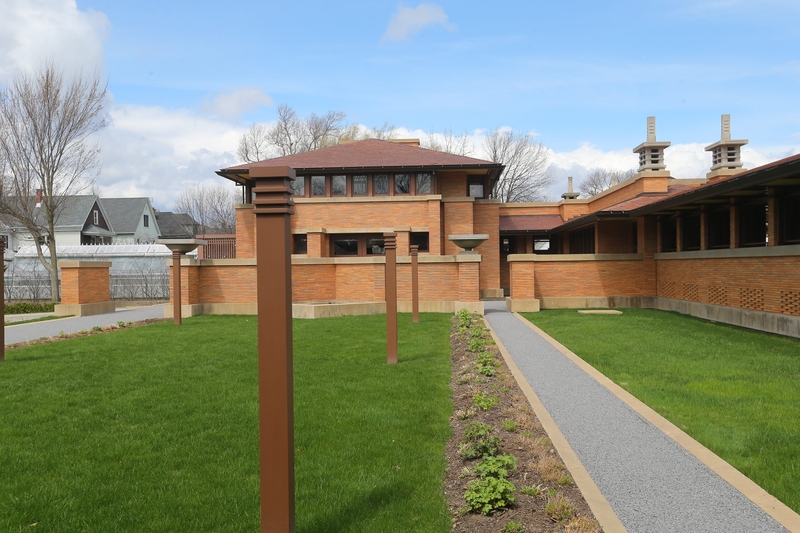 Recreating the landscape is significant because the Martin House Complex’s landscape and structures were integral to Wright’s vision of integrating buildings with nature to create an overall harmony. “To have the landscape back in place means we have another one of the basic elements of Wright’s integrated, organic design, blending buildings, landscape, art glass, furnishings and decorative elements in a total work of design genius,” Roberts said. “This was an extravagant commission for Wright. He revered nature, and this was considered to be one of his greatest landscape achievements,” she said. “We’re in a city that has one of the best garden walks in America, so it will be an enormous enhancement to the public aspect of the Martin House, the Parkside community and Buffalo,” she said. The map for moving forward came after the site’s history was researched, the landscape’s significance identified, existing conditions and their evolution documented and treatment recommendations made for the significant features on the grounds. A similar document was done for the Martin House Complex’s buildings years earlier. “We are basically recreating the landscape as it existed with the constraints we have today,” Steele said. Those include the Martin House’s conversion to a museum and plants that may no longer be available. “The landscape will very closely resemble what was there, based on all the research that was done,” said Mark H. Bayer, the company’s principal-in-charge. Plans include replacing the seven American elm trees decimated by Dutch elm disease in the 1950s with a newer variety of disease-resistant American elm. Wright worked with Walter Burley Griffin, his landscape architect who doubled as office superintendent for the Martin House project. Contrary to some belief, the landscape isn’t a Japanese design, despite the influence of Japanese architectural and landscape ideas on Wright, Steele said. The research included numerous letters between Martin and Wright that revealed Martin was extensively involved in landscape decisions. “Darwin and Isabelle Martin were committed gardeners, and what surprised me was their sentimentality toward nature, and the length that Darwin Martin would particularly go to do his own research,” Steele said. “Every time Wright or Griffin proposed something in a plan, drawing or correspondence, Martin would research it to no end. Martin knew Wright was the design genius, but he was a self-taught man and didn’t let things go,” Steele said. The state Environmental Protection Fund is providing $200,000 and the City of Buffalo has given $60,000 toward the project. In addition, a $50,000 gift was received from the estate of Norma L. Wiegley, a longtime Martin volunteer, which paid for the cultural report. “That was a generous, generous gift from someone who worked, along with her daughter, in the gardens for many years,” Roberts said. She hopes the $750,000 needed to complete the project will come from national foundations that support historic landscape projects, as well as supportive individuals. The Martin House itself needs about $3 million to be completed, which would bring the total investment in the complex to $50 million. The final phase, which involves all of the finishes, is underway. Work on the basement level is expected to be completed in May. Work will then start on the first floor and is expected to take about a year, leaving the second floor to be finished. Completing the furnishings is also within sight. Only a few need to be added back to the house, Roberts said, including a Wright-designed case clock now being restored by conservators. A few more barrel chairs need to be replicated, while craftsmen are working on the last, built-in furnishings. Replicating and acquiring original art glass windows is expected to take years, but more than half the windows are now present, which Roberts said were enough for interpretive purposes.